Bowfishing is a popular hobby taken up by many people in the U.S. As the name suggests bowfishing requires the use of special equipment such as bows and arrows. However, one of the most important parts of the arrows is the arrow tip or point. This part determines whether the arrow will go into the fish and actually stop it from moving away. Although bowfishing arrow tips are designed to go through fish targets and cause legal damage, you do not have to crank the fish back in. 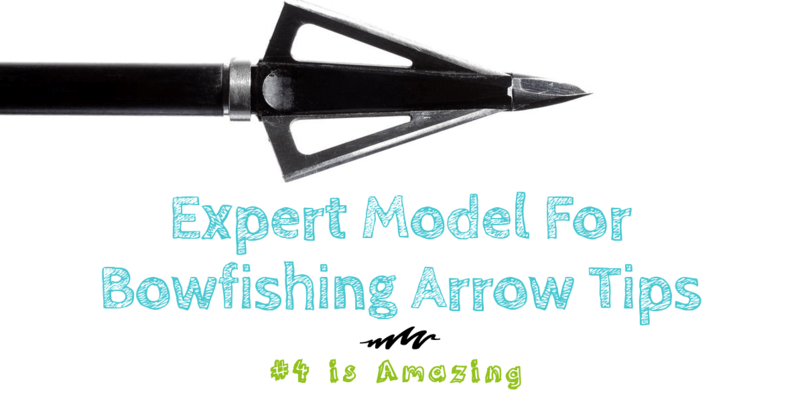 Some bowfishing arrow tips feature a quick release point with fixed barbs and a holding area. This means that you will need to release the barbs before releasing the fish from the arrow. Releasing the barbs involves twisting the tip several times to release the barb before turning them back and pulling the arrow through the fish. Other arrows have quick release, replaceable tips. The barbs on this tips collapse on the shot and offer about half an inch of holding area. Releasing a fish from this tip simply involves twisting the shaft of the arrow several times. However, one of the most significant disadvantages of this type of fishing tip is that the fish can free itself while still the water. Some arrow points offer a large holding area and may come with or without replaceable tips. An important advantage of these points is their compact design. These tips also allow you to easily release the barbs by twisting the arrow shaft. The barbs of some fish points collapse when the arrow passes through the fish. As you pull back the arrow, the barbs open up holding on tightly to the catch. These tips often come with a holding diameter of about two and a half inches. They often do not come with replaceable points and are often less expensive than other arrow points. However, the disadvantage of these fishing points is that they can allow the fish to spin itself free. Many anglers prefer to use trophy tips that allow you to hold on to trophy-sized fish until it is in the boat. This type of arrow tip is often replaceable and has a long rotating barb. The holding area is usually about two inches. They also have collapsible barbs that catch and hold on to fish when pulled back. This eliminates chances of the fish spinning itself free. However, removing fish that have been caught with these tips is not easy. You will have to completely remove the tip and barb before pulling it back through the fish. However, if you are after trophy fish and is not worried about time, then this type of arrow tip would be a great choice. 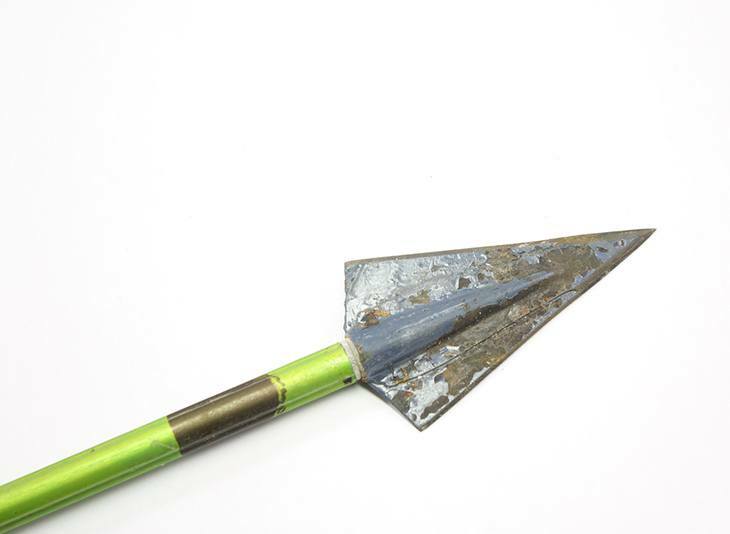 Some of the most common bowfishing arrow tips are the broadhead and field tips. The latter feature thin pointy tips and are often used for target practice. From a fishing point of view, field tips are often considered ineffective because they inflict pain but do not often kill the fish. On the other hand, broadhead arrow tips come with two to four sharp blades that slice through the fish killing it within a few minutes. Broadhead arrow tips can be tested by passing them through rubber bands across a small opening. If the tip cuts through the rubber bands easily, then the broadhead is sharp and ready for fishing. There is a wide range of broadhead designs and blade configurations, which makes it difficult for some anglers to choose the most suitable option. Bowfishing arrow tips manufacturers often come up with new models of arrow tips designed for maximum efficiency and impact stability. Therefore, consider buying newer arrow tips even if you find your current ones quite effective. There are two main types of broadhead arrow tips depending on their physical makeup and the number of blades they have. The two types of broadhead arrow tips include fixed blade and mechanical blade. However, it is possible to find additional variations and subcategories within the two main categories. 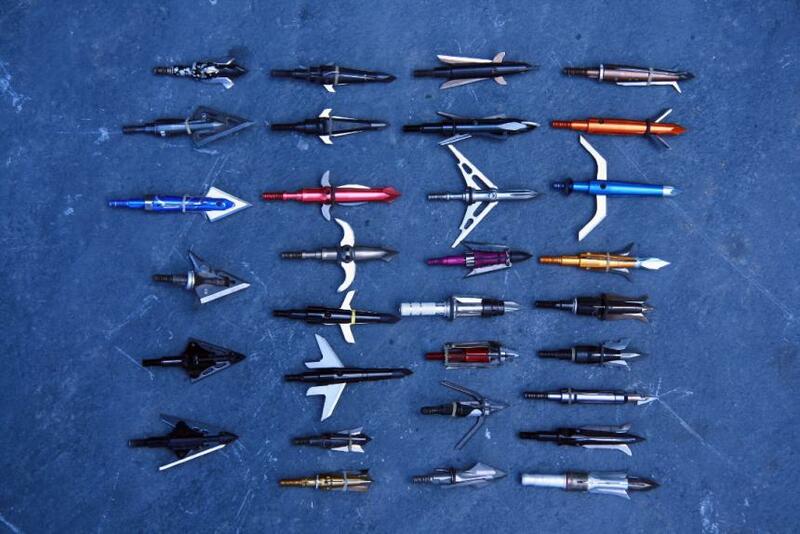 For many anglers, the type of broadhead tip they choose is determined by their personal preferences, arrow speeds, and the type of fish being sought. 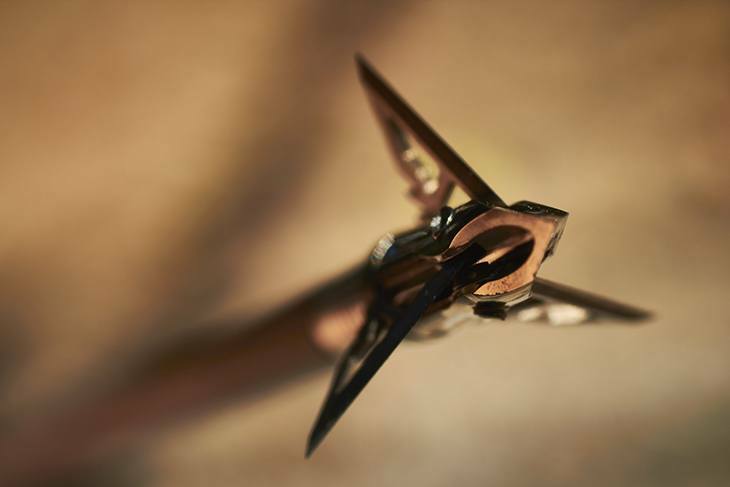 Fixed blade broadheads are suitable for anglers with slower shooting speeds. 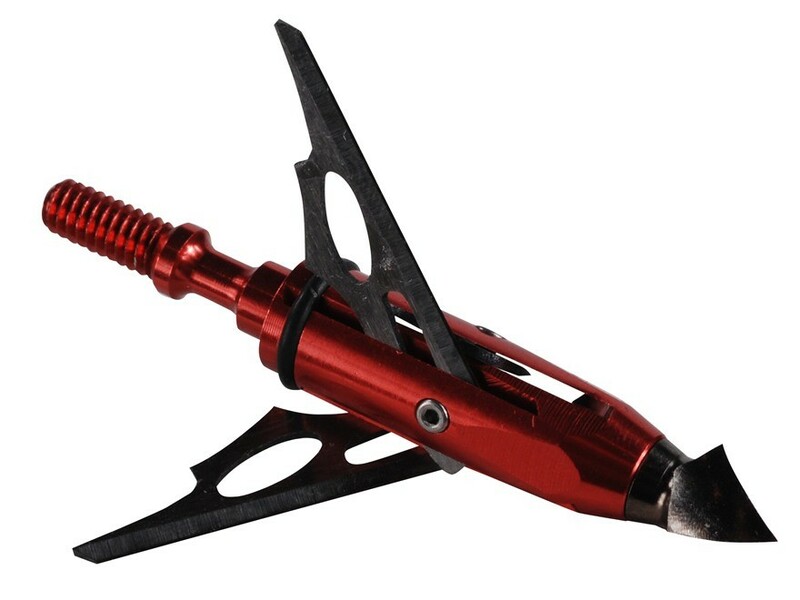 These anglers should also consider using cut-on-contact broadhead arrow tips because they offer minimal resistance, which increasepenetration and the possibility of making a quick, ethical catch. Anglers using bows with faster shooting speeds should consider using fixed or mechanical broadhead arrow tips with larger diameters. The number of blades on an arrow tip determines the impact of the shot, with more blades having a greater impact. Broadhead arrow tips come with varying configurations including fixed head blades, replaceable blades, one-piece blades, and mechanical blades. Unlike fixed head blades, replaceable blades can be removed for sharpening or replacement. One-piece arrow tips feature cutting edges that extend from the tip of the point to rear section of the blade. These arrow tips may have one to four blades. Mechanical blades feature blades that can fold back into the body reducing drag and deflection during flight. The cutting edges of the tip extend upon penetration, hence the name. There are two main categories of fixed head arrow tips including one-piece and replaceable blade tips. One of the reasons why I like using replaceable blade tips is because I do not have to deal with the tiring process of sharpening the edges of the blades. When the blades lose their edge, I simply install a new, sharp blade. One-piece arrow points may have two to four blades. If you are a beginner, consider using fixed blade tips with smaller and fewer blades. A poorly tuned bow will affect the flight and trajectory of an arrow. Arrows that leave with their fletching end raised often drop on release, which affects their trajectory. On the other hand, arrows that leave with their fletching dropped on release often plane upwards. Consider tuning your bow to make it more suitable for the type of arrow point you use. Arrow points that use a chisel tip can pierce through large fish before the blade begins to cut. Chisel tips are designed to enter fish at desired angles with unaltered trajectories. Chisel tips have established a reputation for being durable and can even pierce the skeleton of large fish without being damaged.Cut on contact tips do not have to punch through the flesh of the fish. Instead, they slice through it. This means that the tips do not require lots of energy to be propelled into the flesh of the fish maximizing penetration. These are not the most popular arrow tips on the market because they are not ideal for every bowfishing application. However, they do meet the demands of many dedicated bow-fishing enthusiasts. One of the most significant advantages of mechanical points is that they require minimal tuning to target fish. However, it is important to know that the blades of mechanical points do not have support for trailing edges. Tips with thicker blades can withstand significant amounts of stress and have less flex on impact. Mechanical arrow tips come in two styles; front deploying and rear deploying. Front deploying or over the top arrow points feature hinged blades at the rear of the ferrule. In addition, they often pivot out from the front once they come in contact. The blades of the front deploying points usually open up once they are inside the fish. The entrance holes of front deploying arrow points are often smaller than those of rear deploying arrow points. Rear deploying arrow points fear blades that pivot towards the front and deploy outwards from the rear of the arrow point, which results in full entrance and exit holes. Mechanical arrow points require you to tune your bow to achieve maximum performance, penetration, and accuracy. Take some time to tune your bow for mechanical arrow points because even slight variations in tuning can significantly affect the trajectory of the arrow points. It is important to use arrow points with the suitable weight. The recommended weight of a fishing arrow point is 100 grams for carbon and aluminum arrow points and 125 grams for heavier arrows. Once you choose the weight and style of your arrow point, it is important to set up and tune your bow to enhance accuracy. However, before you start tuning your bow, make sure that your arrows are straight and that the arrow points are properly installed. You can check the alignment of your arrowhead by spinning your arrows and checking for wobbles of either the head or shaft. Wobbling heads and shafts are not properly tuned. It is important to keep a dozen of arrows aside strictly for fishing to eliminate the potential of wear from use during practice sessions.